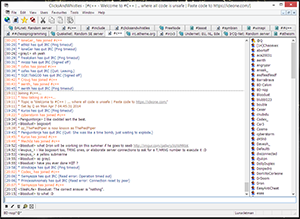 ClicksAndWhistles is a free IRC client for Windows. 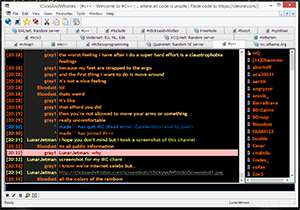 Internet Relay Chat (IRC) is a form of real-time Internet text messaging allowing you to communicate with others in IRC channels (chat rooms) and one-to-one communication via private messages. You can also connect directly with another user to chat or send/receive files. 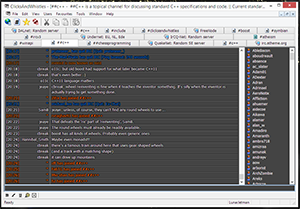 There are hundreds of IRC networks and thousands of IRC servers providing channels covering a wide variety of topics; you can even start your own channel with little or no fuss. 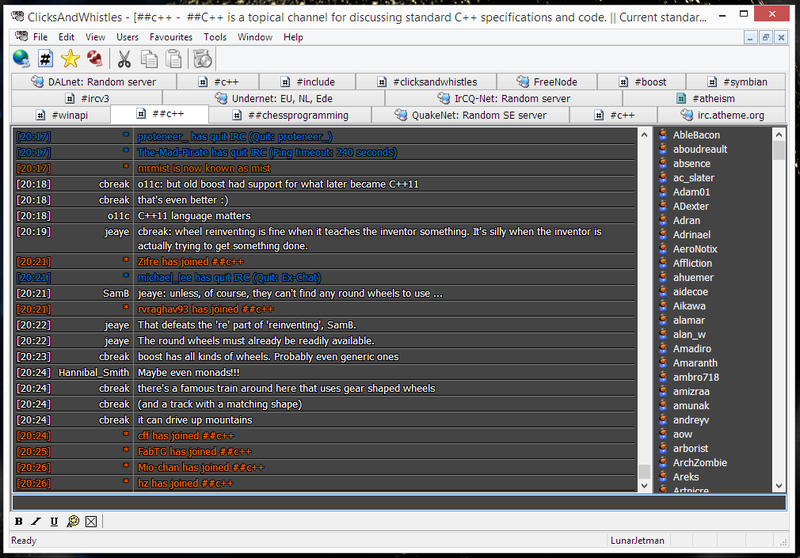 Websites such as Search IRC and irc.netsplit.de let you search for channels on specific topics. Multiple server connections and multiple "identities" allowing you to have different nicknames on different servers. Unicode (UTF-8), "mixed" and "ANSI" (code page) character encodings supported, configurable on a per-channel/window basis. Channel favourite list with configurable key press shortcuts. Contacts (buddy lists) and user highlighting allowing you to associate different colours with different users. Keywords letting you know when somebody has mentioned something of interest to you or perhaps has mentioned your nickname. Optionally play a sound when a keyword appears. Support for emoticons including animated GIFs. Optionally play a sound when an emoticon appears. Two text display modes ("normal" or "column"). Configurable themes, image backgrounds, outline fonts, colour gradient effects. Different window modes (tabbed, "place on desktop" and MDI). Minimize to tray with activity popup and sound event notifications. Full logging support including archiving and "scrollback logs" (previous session history). 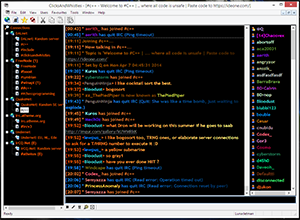 File transfers (DCC SEND) and direct chat (DCC CHAT). Identd support. Secure (SSL) server support. This product includes software developed by the OpenSSL Project for use in the OpenSSL Toolkit. (http://www.openssl.org/). "Connection scripts" (a simple list of commands to run once connected) and "macros" (use one command to automatically run a series of other commands). 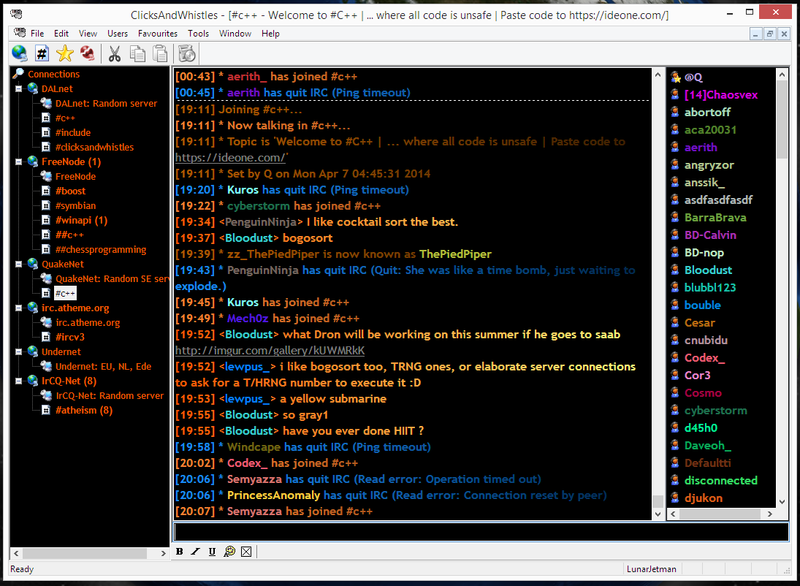 "A clean, neat interface and great depth of features make this IRC client well worth using" - PC Plus magazine. A "great app" with "a very clean and intuitive interface" - addictive tips. 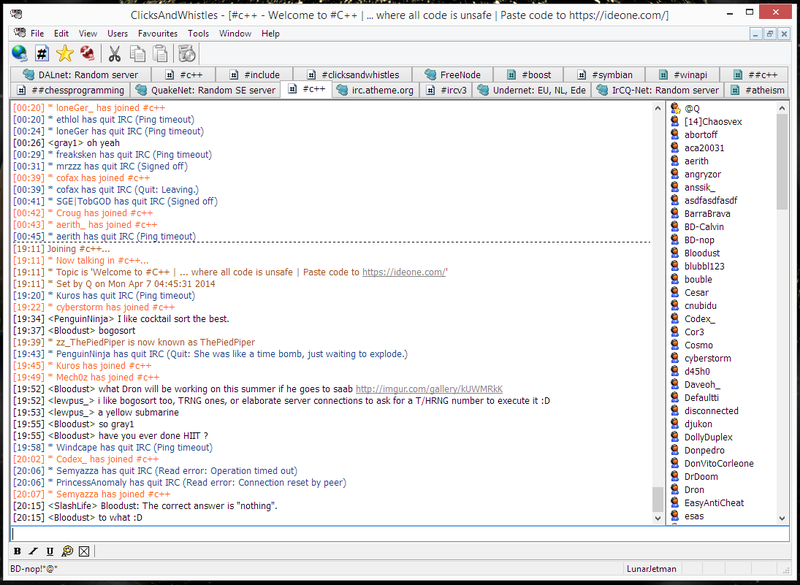 "With several customizable features, ClicksAndWhistles stands apart from its competitors as an IRC client"; "Interface is well-designed and lightweight" - softonic. Copyright © 2008-2012 Leigh Johnston. All rights reserved.